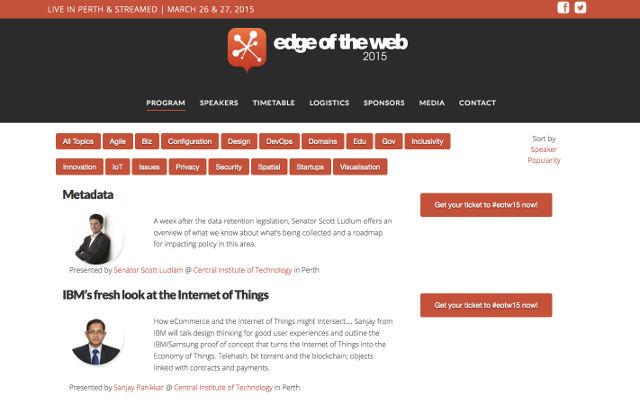 Edge of the Web is the national conference of the Australian Web Industry Association and was held in Perth on March 26 & 27, 2015. I worked with the students at the Central Institute of Technology in phase one and with Joff Crabtree in phase two. Also had good support from Luke John. I briefed, wireframed and managed, then wrote all the content. Site had good overall accessibility and was responsive, using X Theme on WordPress. I also briefed, co-designed and wrote content for the conference site in 2013, working with Eduka.